Sarah Slater was the daughter of Elias Slater and Ruth (?) Sarah Slater married David Holcombe, son of Ensign Joshua Holcombe and Mary Hoskins, on 24 December 1735 at Simsbury, Hartford Co., CT.1,2 Sarah Slater died on 11 January 1762. Elias Slater was the son of John Slater. Philura Hollenbeck married David Holcombe, son of David Holcombe and Sarah Slater. [S45] Albert C. Bates, Simsbury, Page 114. David Holcombe was born on 30 November 1737 at Simsbury, Hartford Co., CT.2 He was the son of David Holcombe and Sarah Slater.3 David Holcombe married Philura Hollenbeck. David Holcombe died in 1776. Seaver says David's father married Phillina but since the father's wife Sarah did not die until 1762 and David and Phillina had child Anna in 1760, this would be highly unlikely. It is not certain that David and Phillina belong here but David's birth and marriage are at the appropriate times for this family. Canaan records indicate that David and Phillina had children. [S65] Deanna Holcomb Bowman Thomas Holcomb, Vol. I:Pg. 134-5. [S45] Albert C. Bates, Simsbury, Page 99. Lt. Timothy Holcombe was born on 19 July 1740 at Simsbury, Hartford Co., CT.4 He was the son of David Holcombe and Sarah Slater.5 Lt. Timothy Holcombe married Abigail Robbins in 1762. Lt. Timothy Holcombe lived at Canaan, Litchfield Co., CT. He died on 18 September 1775 at age 35. He was buried at Shaftsbury, Bennignton Co., VT.
Died while on his way from Fort Ticonderoga on a furlow. He was Lieutenant in Rev. War, Capt. Buell's Company, Hinman's Continental Regiment. Children are recorded in Canaan Records. Sacred to the memory of Timothy Holcomb Lieutenant in the American Army who died in his return from the camp on the 18th of Sept 1775 in the 36th year of his age. Greatly beloved in his life & much lamented in his death. [S23] Jesse Seaver, The Holcomb(e) Genealogy, Page 18. [S25] Hannah McPherson, Holcombe Genealogy, Page 71.1/Item A-4-5-7-3. [S104] DAR DAR Lineage book, Vol. XXXIX:Pg. 283/Item 38768; Vol. LVII:Pg. 271/Item 56790; Vol. LXXIV:Pg 226/Item 73619. Abigail Robbins was born on 27 June 1748. She married Lt. Timothy Holcombe, son of David Holcombe and Sarah Slater, in 1762. Amasa Holcombe was born on 17 January 1742 at Simsbury, Hartford Co., CT.3 He was the son of David Holcombe and Sarah Slater.4 Amasa Holcombe married Eunice Morse, daughter of Solomon Morse and Elizabeth Fenn. Amasa Holcombe married Lois Heath on 27 October 1768. [S65] Deanna Holcomb Bowman Thomas Holcomb, Vol. I:Pg. 135/Item 4583. [S25] Hannah McPherson, Holcombe Genealogy, Page 73.1/Item A-4-5-7-4. Lois Heath married Amasa Holcombe, son of David Holcombe and Sarah Slater, on 27 October 1768. Elijah Holcombe lived at Canaan, Litchfield Co., CT. He was born on 12 December 1744 at Simsbury, Hartford Co., CT.3 He was the son of David Holcombe and Sarah Slater.4 Elijah Holcombe married Ann Kellog. Canaan records contain the births of all of the following children. [S65] Deanna Holcomb Bowman Thomas Holcomb, Vol. I:Pg. 135/Item 4584. [S25] Hannah McPherson, Holcombe Genealogy, Page 71.1/Item A-4-5-7-5. Called Queen Ann. Ann Kellog married Elijah Holcombe, son of David Holcombe and Sarah Slater. Darn! Bowman on Vol I. Page 136, Item 4585 has Sarah Holcombe marrying Samuel Taylor in 1786, son of Eldad and Thankful Day Taylor. Then on Vol II:Page 45, Item 42117 she has Tiriza Holcombe marrying Samuel Taylor in 1786, son of Eldad and Thankful Day Taylor. McPherson on Page 75.2 Item A-4-5-7-6 has Sarah marrying Samuel; then on page 32.2, Item 4-2-1-2-8 Tiriza again marrying Samuel. Tirza is listed both as a daughter of Thomas and Sarah Loomis Holcombe but also as a daughter of Enoch Holcombe. Sarah Holcombe was born on 26 July 1747 at Canaan, Litchfield Co., CT.2 She was the daughter of David Holcombe and Sarah Slater.2 Sarah Holcombe married Samuel Taylor, son of Eldad Taylor and Thankful Day, in 1786. [S25] Hannah McPherson, Holcombe Genealogy, Page 75.2/Item A-4-5-7-6. Noah Holcombe was born on 12 August 1750 at Canaan, Litchfield Co., CT.3 He was the son of David Holcombe and Sarah Slater.3 Noah Holcombe married Hannah Marsh. Noah Holcombe probably married as his second wife, Sarah Holcombe, his cousin, daughter of Joel Holcombe and Sarah Bull, between 8 January 1789 and 12 March 1793.4 Noah Holcombe died on 22 September 1841 at age 91. McPherson doesn't show the marriage to Sarah Holcombe, nor does she show Elias and any of the female children. Bowman lists 12 children. In Revolutionary war records, in a power of attorney form signed by Olive Elton, the daughter of Noah Holcomb she swears that her father died on 22 September 1841. [S65] Deanna Holcomb Bowman Thomas Holcomb, Vol. I:Pg. 136. [S25] Hannah McPherson, Holcombe Genealogy, Page 75.2/Item A-4-5-7-7. Hannah Marsh married Noah Holcombe, son of David Holcombe and Sarah Slater. Hannah Marsh died in 1826. Abraham Holcombe was born on 20 June 1753. He was the son of David Holcombe and Sarah Slater. Abraham Holcombe married Betsey Bosworth on 15 February 1777. Enlisted July 1, 1780 as a private in the 5th Conn. Regt. in American Revolution; discharged Dec 13, 1780; served in Conn in Continental line; on US pension roll 72 years old. Moved to Plymouth, Chenango Co., NY. is recorded in the 1800 cnesus of Addison Co., Vt. as head of family. Both Abraham and Betsey have inscribed gravestones in cemetery north of and near Plymouth. [S23] Jesse Seaver, The Holcomb(e) Genealogy, Page 19/Item 116. [S25] Hannah McPherson, Holcombe Genealogy, Page 77.2/Item A-4-5-7-8. [S25] Hannah McPherson, Holcombe Genealogy, Page 77.2, 78.2; item A-4-5-7-8-8. Betsey Bosworth was born on 2 June 1758. She married Abraham Holcombe, son of David Holcombe and Sarah Slater, on 15 February 1777. Betsey Bosworth died on 11 March 1846 at Plymouth, Chenango Co., NY, at age 87. [S25] Hannah McPherson, Holcombe Genealogy, Page 71.1, Item A-4-5-7-9. [S25] Hannah McPherson, Holcombe Genealogy, Page 79.2, Item A-4-5-7-9. [S25] Hannah McPherson, Holcombe Genealogy, Page 79.2, Item A-4-5-7-9-2. Mary Holcombe was born on 11 February 1755. She was the daughter of David Holcombe and Sarah Slater. 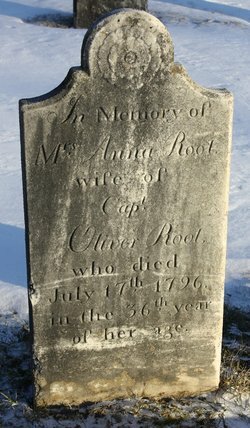 From the Root Genealogy, by James Pierce Root, "Oliver Root son of Samuel, grandson of Samuel, born in 1754, married at Southington, CT, 1 October 1778, Anna, daughter of David Holcomb of Canaan. He removed from South Canaan to Lenox, Mass where he died September 5, 1797, age 43." Oliver was descended from Gov. John Webster of Connecticut through his mother, Sarah Webster. [S65] Deanna Holcomb Bowman Thomas Holcomb, Vol. II:Pg. 76/Item 45811. [S392] William Webster and Melville Webster, Gov. John Webster, Page 166. Oliver Root was born on 1 November 1754 at Farmington, Hartford Co., CT.1,2 He was the son of Samuel Root and Sarah Webster. Oliver Root married Anna Holcombe, daughter of David Holcombe and Philura Hollenbeck, on 1 October 1778 at Southington, Hartford Co., CT; Another source says they were married in Canaan, Litchfield Co., CT.1 Oliver Root died on 5 September 1797 at Lenox, Berkshire Co., MA, at age 42.1 He was buried at Church on the Hill Cemetery, Lenox, Berkshire Co., MA. A second Abraham, this one to second wife; but Seaver does not offer any comment. Abraham Holcombe was born on 14 February 1762. He was the son of David Holcombe and Philura Hollenbeck. Elizabeth Holcombe was born in 1772. She was the daughter of David Holcombe and Philura Hollenbeck. Elizabeth Holcombe married William Boardman, son of Nathaniel Boardman and Mabel Holmes, in 1797. [S65] Deanna Holcomb Bowman Thomas Holcomb, Vol. II:Pg. 77/Item 45819. Philura Holcombe was born on 4 January 1768. She was the daughter of David Holcombe and Philura Hollenbeck. [S25] Hannah McPherson, Holcombe Genealogy, Page 71.1/Item A-4-5-7-14. Lucretia Holcombe was born on 21 June 1770. She was the daughter of David Holcombe and Philura Hollenbeck. Solomon Holcombe was born on 29 January 1775. He was the son of David Holcombe and Philura Hollenbeck. [S25] Hannah McPherson, Holcombe Genealogy, Page 81.1/Item A-4-5-7-18. Sarah Holcombe was born on 3 May 1776. She was the daughter of David Holcombe and Philura Hollenbeck. McPherson lists this David as A-4-5-7-17. But as previously stated, she missed a generation and he is probably A-4-5-7-1-8. David is recorded in the 1850 cnesus of Canaan, District 33, Litchfield Co., CT, as a farmer,owning real estate $3000, living with son Nelson Holcombe. David Holcombe was born on 2 January 1773. He was the son of David Holcombe and Philura Hollenbeck. David Holcombe married Sarah Tubbs. David Holcombe died on 8 August 1858 at age 85. [S65] Deanna Holcomb Bowman Thomas Holcomb, Vol. II:Pg. 77/Item 45818. Seaver lists this child and family. Robert Holcombe was born on 29 October 1779 at Canaan, Litchfield Co., CT. He was the son of David Holcombe and Philura Hollenbeck. [S65] Deanna Holcomb Bowman Thomas Holcomb, Vol. II:Pg. 77/Item 45810. [S25] Hannah McPherson, Holcombe Genealogy, Page 81/Item A-4-5-7-19. McCracken disputes Simsbury Records that show birth 1718/19. Robert Holcombe was born on 2 March 1717 or 1718 at Simsbury, Hartford Co., CT.1 He was the son of Ensign Joshua Holcombe and Mary Hoskins.2 Robert Holcombe died on 8 March 1717 or 1718 at Simsbury, Hartford Co., CT.
[S65] Deanna Holcomb Bowman Thomas Holcomb, Vol.I:Pg/58. [S52] Henry R. Stiles History of Ancient Windsor II, Vol. II:Pg. 180/Family 13. Mathew Holcombe was born on 30 May 1730 at Wintonbury (now Bloomfield), CT. He was the son of Matthew Holcombe and Lois Drake. Elijah Holcombe was born on 5 March 1731/32 at Wintonbury (now Bloomfield), CT. He was the son of Matthew Holcombe and Lois Drake. Elijah Holcombe married Sarah Evans on 28 November 1753. The baptisms of the children are cited by Stiles from a Windsor church record. An Elijah Holcombe, of Muskingdom County, Ohio, age 84 in 1819, received a pension for serving in the Pennsylvania Line. Wier, WR, and Stiles list their children. [S65] Deanna Holcomb Bowman Thomas Holcomb, Vol. I:Pg. 131/Item 4562. [S25] Hannah McPherson, Holcombe Genealogy, Page 65.1/Item A-4-5-5-2. Of Hartford. Sarah Evans married Elijah Holcombe, son of Matthew Holcombe and Lois Drake, on 28 November 1753. Eli Holcombe was born on 30 August 1734. He was the son of Matthew Holcombe and Lois Drake. Eli Holcombe died in 1833. John Holcombe was born on 5 October 1749. He was the son of Matthew Holcombe and Lydia Porter. Luther Holcombe was born on 12 August 1752 at Danbury, Fairfield Co., CT. He was the son of Matthew Holcombe and Lydia Porter. Luther Holcombe married JoAnna Beebe at Danbury, Fairfield Co., CT. Luther Holcombe married Joanna Kellogg. Luther Holcombe married Sarah Newton in 1819. Luther Holcombe died on 20 July 1839 at Coventry, Chenango Co., NY, at age 86. He was buried at North Afton, NY. For his Revolutionary War exploits see Stiles (2:396). Luther and first wife JoAnna had four children, two remain unidentified. Luther and Johanna had nine children, two are also unidentified. Information also from Jean Holcombe. [S65] Deanna Holcomb Bowman Thomas Holcomb, Vol.I:Pg.59, 131-132. [S25] Hannah McPherson, Holcombe Genealogy, Page 66.1/Item A-4-5-5-8. JoAnna Beebe married Luther Holcombe, son of Matthew Holcombe and Lydia Porter, at Danbury, Fairfield Co., CT.
McCracken shows 2 Miriams, the first d.y. Miriam Holcombe was born on 18 January 1719/20 at Simsbury, Hartford Co., CT.1 She was the daughter of Ensign Joshua Holcombe and Mary Hoskins. Miriam Holcombe married Noah Case, son of John Case and Abigail Humphrey, on 5 May 1740 at Simsbury, Hartford Co., CT.2 Miriam Holcombe died on 28 April 1795 at Simsbury, Hartford Co., CT, at age 75. [S45] Albert C. Bates, Simsbury, Page 156. McCracken notes this Noah is son of John Case (John, John) by his wife Abigail Humphrey. Ruth Cost Duncan cites Simsbury Vital Records. Noah Case was born on 4 October 1720 at Simsbury, Hartford Co., CT. He was the son of John Case and Abigail Humphrey. Noah Case married Miriam Holcombe, daughter of Ensign Joshua Holcombe and Mary Hoskins, on 5 May 1740 at Simsbury, Hartford Co., CT.4 Noah Case died on 17 December 1797 at Simsbury, Hartford Co., CT, at age 77. [S94] Nathaniel Goodwin, Genealogical Notes, or Contributions to the Family History of Some of the First Settlers of Connecticut and Massachusetts, Page 278/Item 34. [S101] Ruth Cost Duncan, John Case, Page 20/Item 30. Not in Seaver, McCracken states not in father's will. Bathsheba Holcombe was born on 3 January 1721/22 at Simsbury, Hartford Co., CT.1 She was the daughter of Ensign Joshua Holcombe and Mary Hoskins. [S45] Albert C. Bates, Simsbury, Page 154. [S45] Albert C. Bates, Simsbury, Page 150.